With the Super Bowl kicking off today, I’m back once again with my buddy and Gridiron Uniform Database co-founder, Timmy Brulia, who has — as he has for the past several seasons — provided YEOMAN research into the uniforms worn by the two Super Bowl combatants. 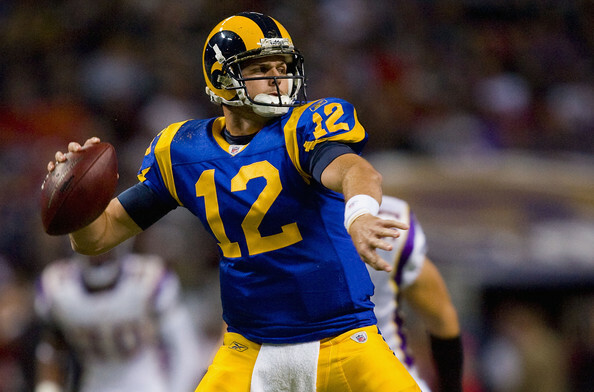 Today is Part II of the Rams uniform history — if you missed Part I, click here. 2018: The basic combos are worn as well as the navy color rush set, which is worn for two games (Weeks 5 and 9). 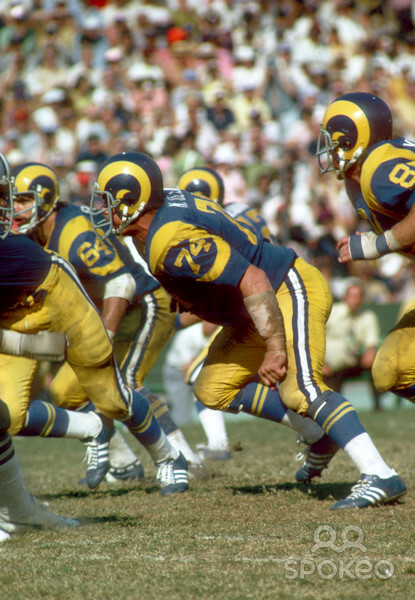 Today’s post covers the Rams unis from 1973 to the present. Yesterday we looked at the 1937-1972 uniforms. All of this research has been painstakingly and lovingly worked into the aforementioned Gridiron Uniform Database (or GUD, for short), which readers of Uni Watch know is THE go-to site for NFL (and other football league) uniform histories. Each year, I ask Tim to please send me a year-by-year breakdown of the uniforms — then I go hunting for the photos which appear with the writeups (which takes me hours, but is honestly a labor of love). I can’t imagine how long it’s taken Tim to do the written research. So without further ado, here’s Tim with the final part. Enjoy! 1973: Major changes. The yellow returns! The horns on the helmet are yellow for the first time since 1963. The blue jerseys are a wee bit lighter in hue than in recent years and feature a yellow v-neck and numbers. The sleeves feature a yellow ram horn design that begins at the armpit, encircles the shoulder and come to a point on the sleeve. The yellow TV numbers fit comfortably within the horn. The only thing white on the jersey is the nameplate. 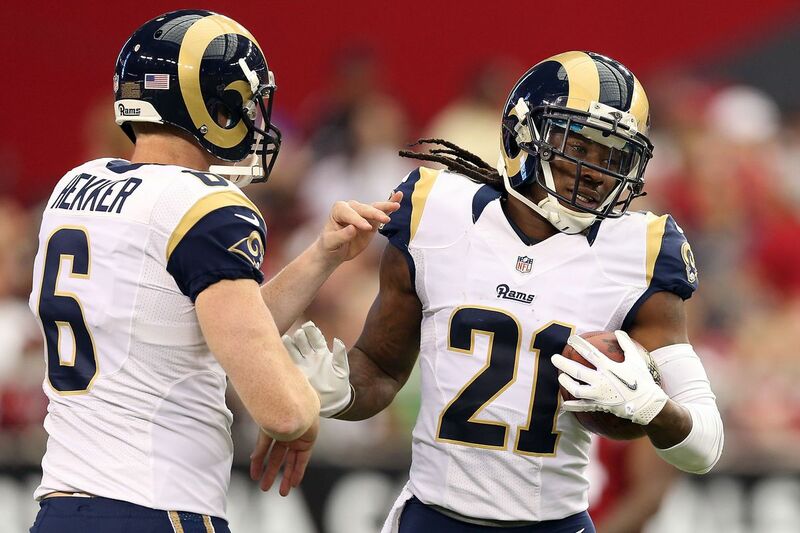 The white jersey has blue numbers, a blue v-neck and the ram horns on the sleeves in blue. The sleeves themselves are yellow. The pants are yellow with a blue/white/blue stripe pattern. The blue socks are adorned with two yellow stripes, the first time stripes appear on the socks in 28 years. 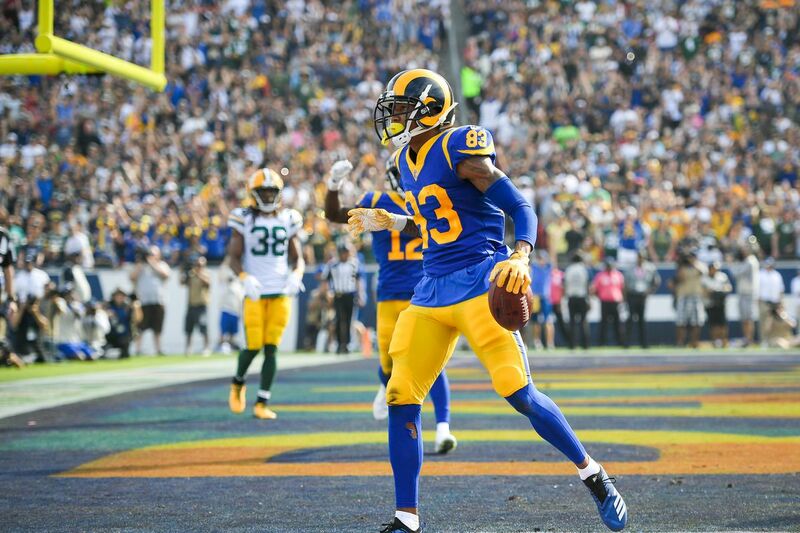 The Rams even color coordinate the cleats, with blue cleats worn with the blue set and white shoes worn with the white set. 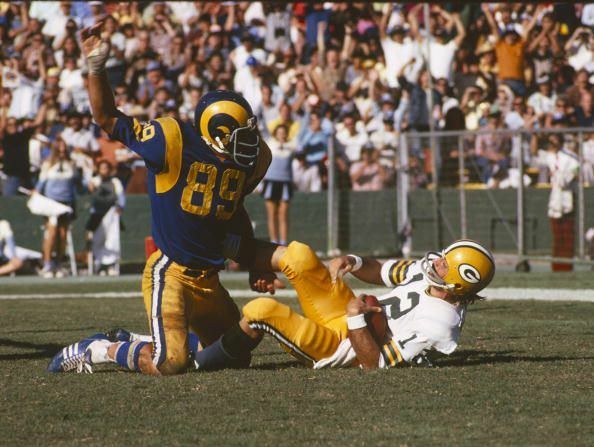 1976: The Rams eventually drop the blue cleats for white exclusively. 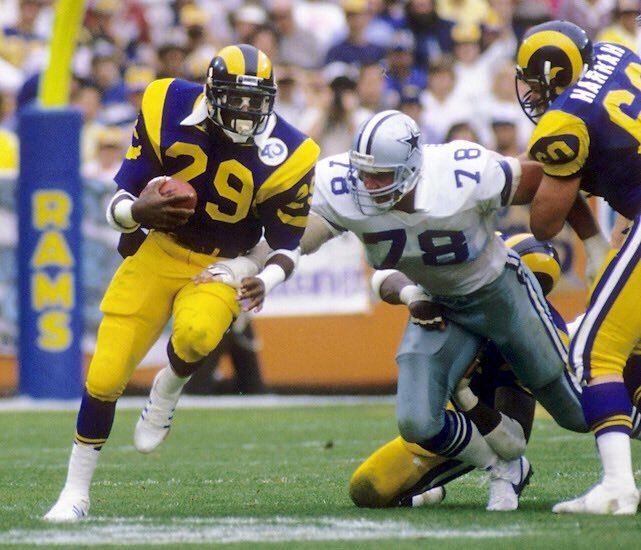 1981: The Rams switch from gray facemasks to blue ones. 1982: The Rams wear white jerseys only in this strike-shortened season. 1985: The Rams celebrate their 40th season in L.A. with a funky patch worn on the left collarbone. 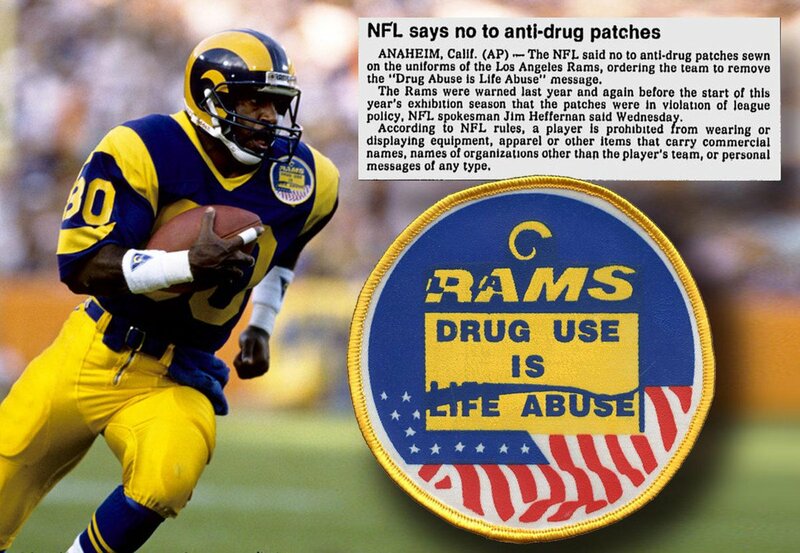 1988: A patch proclaiming “Drug Use Is Life Abuse” is worn from 10/23 through the end of the season. 1993: White jerseys are worn for all 16 games. 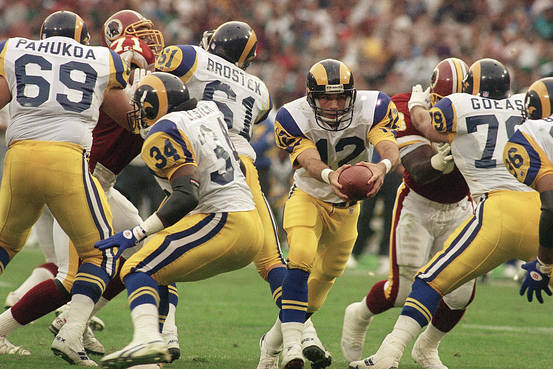 1994: Like all other squads, the Rams wear the NFL’s 75th season patch on the left collarbone. 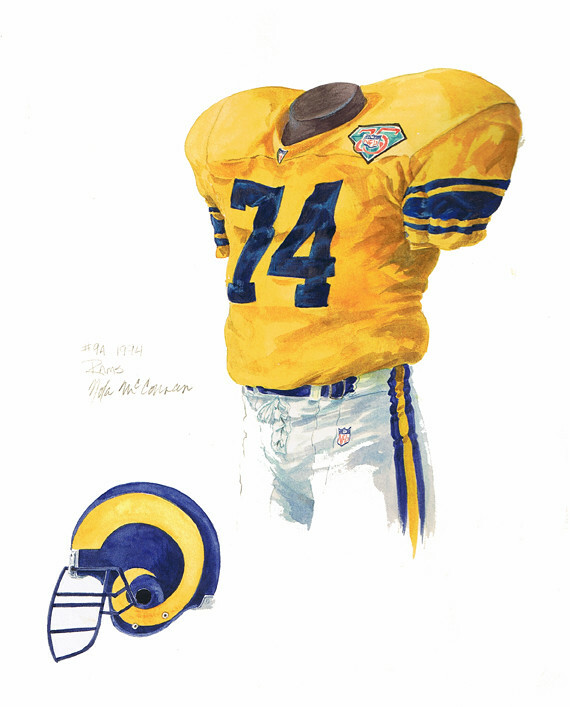 As part of the NFL celebration, the Rams wear throwbacks for Weeks 3 and 4, wearing the 1950-52 style yellow jersey with blue front and back numbers, blue northwestern sleeve stripes and a blue NOB. White pants with blue/yellow/blue stripes and solid blue socks. 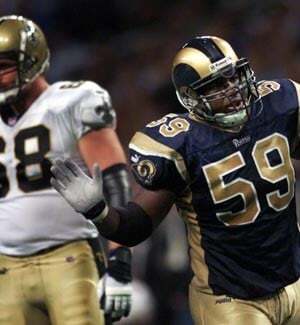 1995: After playing in La La Land since 1946, the Rams move to St. Louis and the only change to the clothing is the blue socks going stripeless. 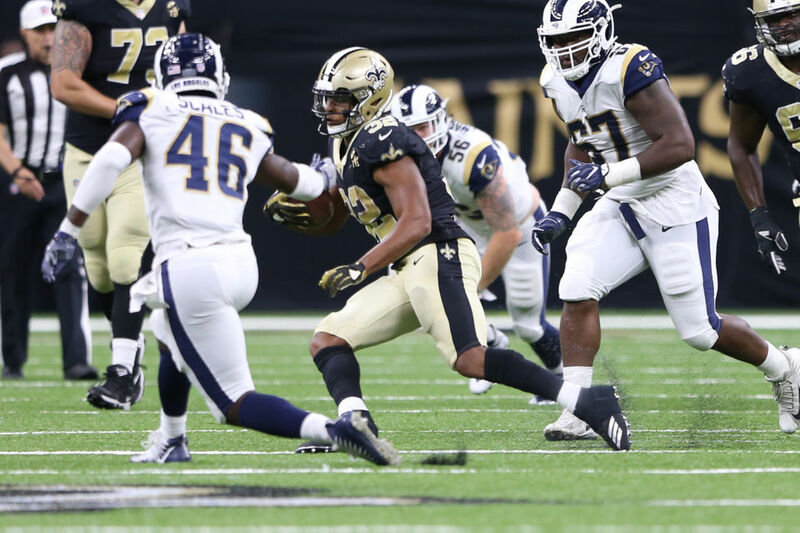 It took several weeks, but with the 10/15 game, the Rams wore a patch commemorating their first season in St. Louis on the left collarbone of both sets. 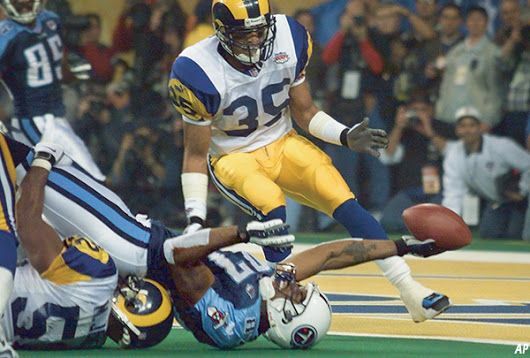 1999: In their Super Bowl appearance against the Tennessee Titans, the Rams sport the Super Bowl XXXIV logo patch on the collarbone of their white jerseys. 2000: Bit of an overhaul of the unis for The Greatest Show on Turf. The yellow becomes a champagne gold and the blue goes a few shades darker. The blue jersey now features a gold neckline, gold front, back and shoulder numbers with white outline, white NOB, gold and white shoulder stripes that transition to gold side panels, a new Rams logo on the sleeves and a small Rams wordmark just below the neckline. 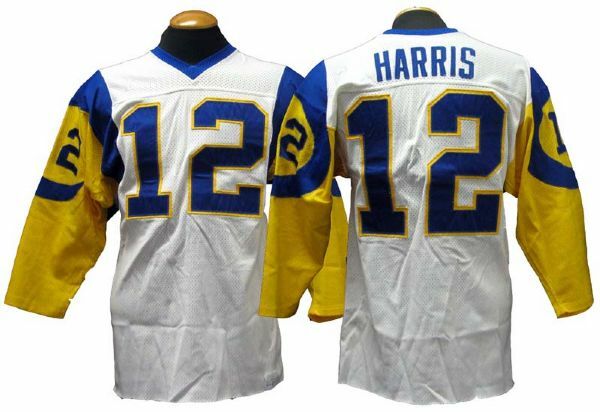 The white jersey retains the blue neckline, blue front, back and shoulder numbers with gold outline, blue NOB, gold shoulder stripe that become side panels, blue sleeves with the Ram logo and a small Rams wordmark just under the neckline. The pants become gold with no striping and the socks remain a solid, though darker blue. 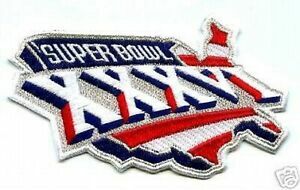 2001: For their Super Bowl showdown against the New England Patriots, the Rams wear the Super Bowl XXXVI patch on the left collarbone. 2002: The sidepanels on both sets are deep sixed. 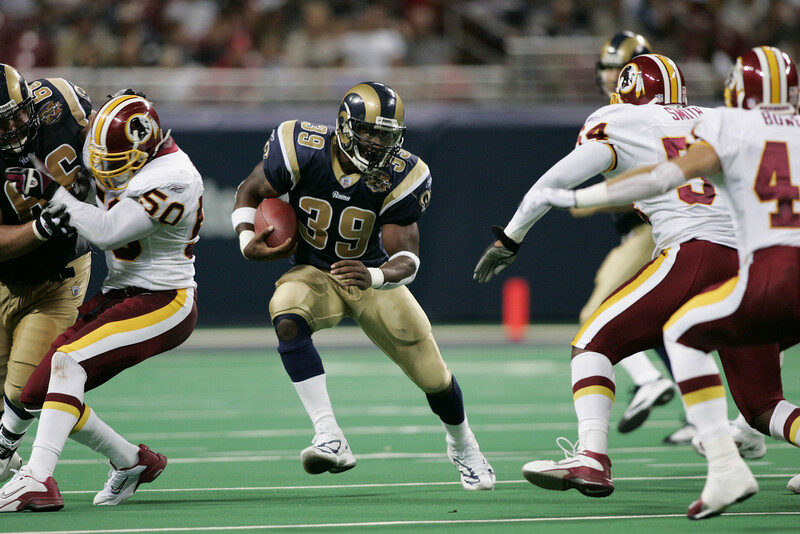 2003: For two early season games (Weeks 1 and 3), dark blue pants are worn with the white jerseys, featuring thin white/thin gold/thick dark blue/thin gold/thin white stripes. 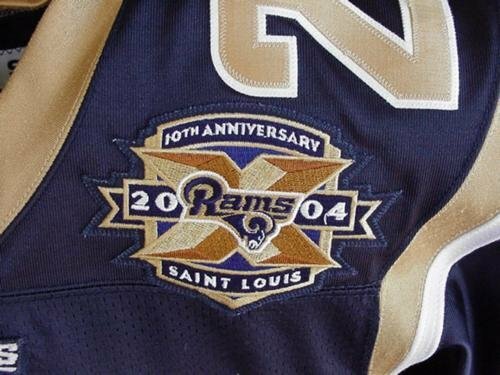 2004: No dark blue pants this season, but a 10th “anniversary” patch for being in St. Louis is worn on the place where patches are worn on both sets. 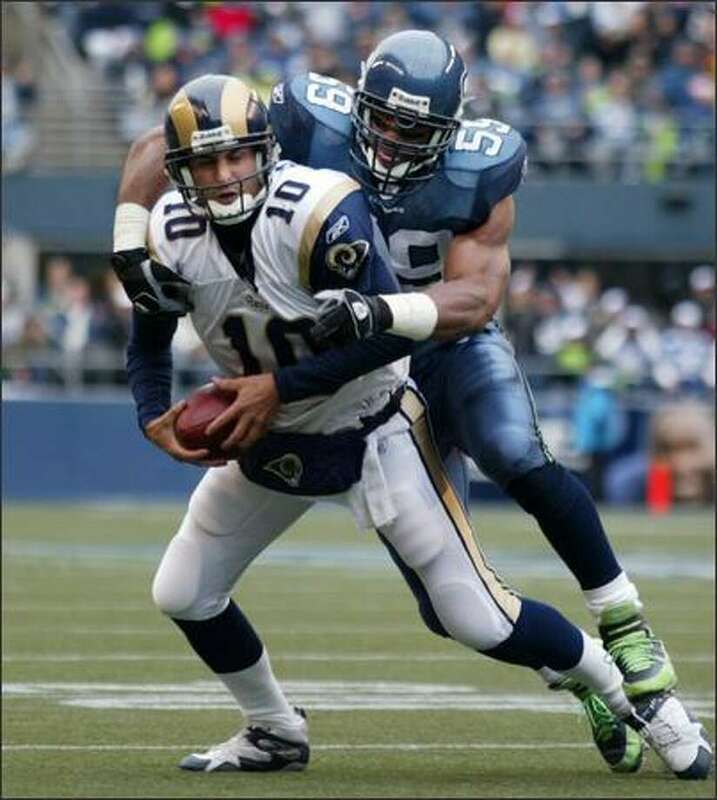 2005: In Weeks 11 and 17, the Rams breakout the 2003 dark blue bottoms with the dark blue jerseys, and join in the monochrome brigade. 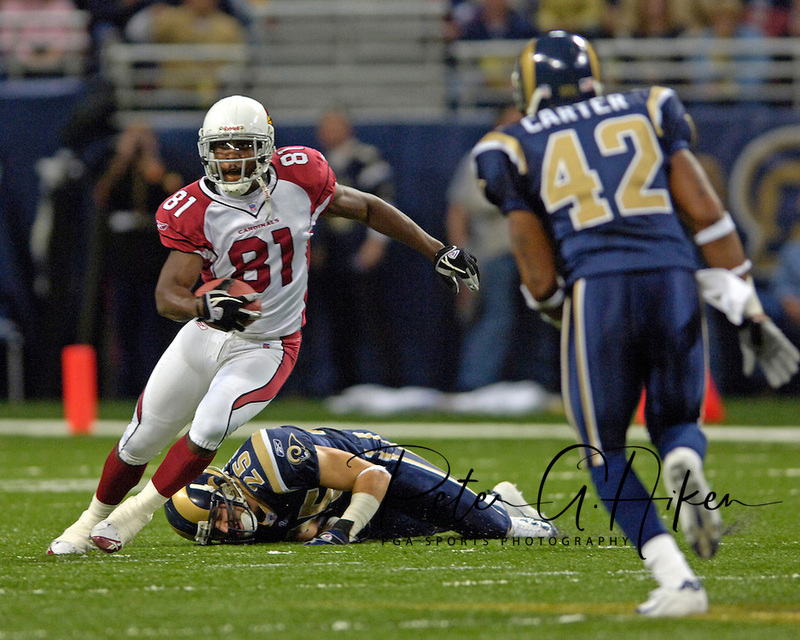 2006: A pair of white pants, with side stripes of thin dark blue/thick gold/thin dark blue makes its appearance with the white jersey for Week 11. 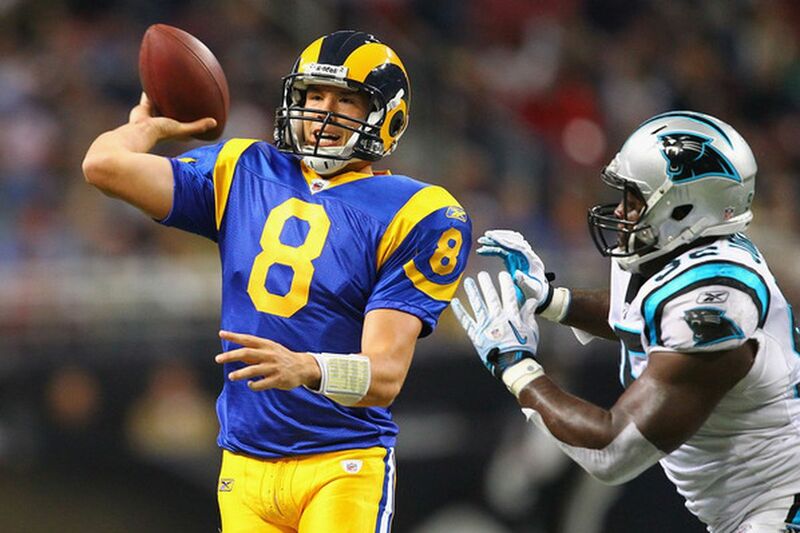 2007: The Rams go bananas and wear six combos; white/white, white/gold, white/blue, blue/white, blue/gold and blue/blue. 2008: A memorial patch for late owner Georgia Frontiere is worn on the left collarbone of both jerseys. 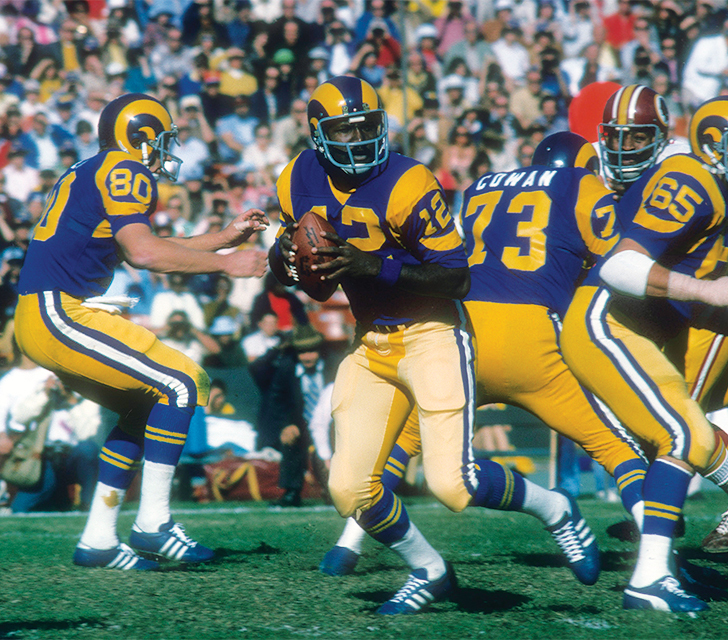 For Week 1, a league-wide Gene Upshaw memorial patch is worn by the Rams on the right collarbone of the dark blue jersey. Four uni combos are worn: white/gold, white/blue, blue/white and blue/blue. 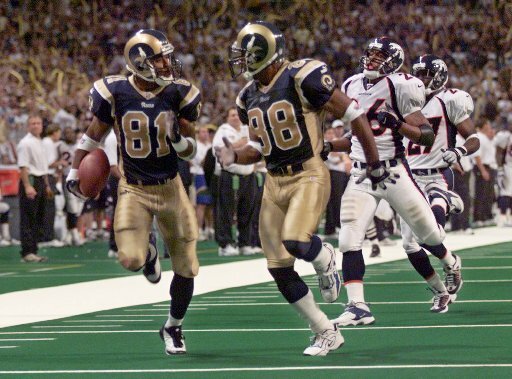 2009: In addition to combos of white/white, blue/white, blue/gold and blue/blue, the Rams dig out the blue 1973-1999 era outfits with solid blue socks for Weeks 5 and 15. 2010: All 6 possible uni combos are worn and the (73-99) throwbacks. 2011: Same as 2010, plus as part of a league-wide 9/11 tribute, a 9/11 patch is worn on the left collarbone of the blue jersey for Week 1. 2012: The gold pants are discarded, resulting in four combos, plus the throwback. With Nike assuming the uniform supplier role for the NFL, the Rams adopt the so-called “flywire” collar on all three jerseys. 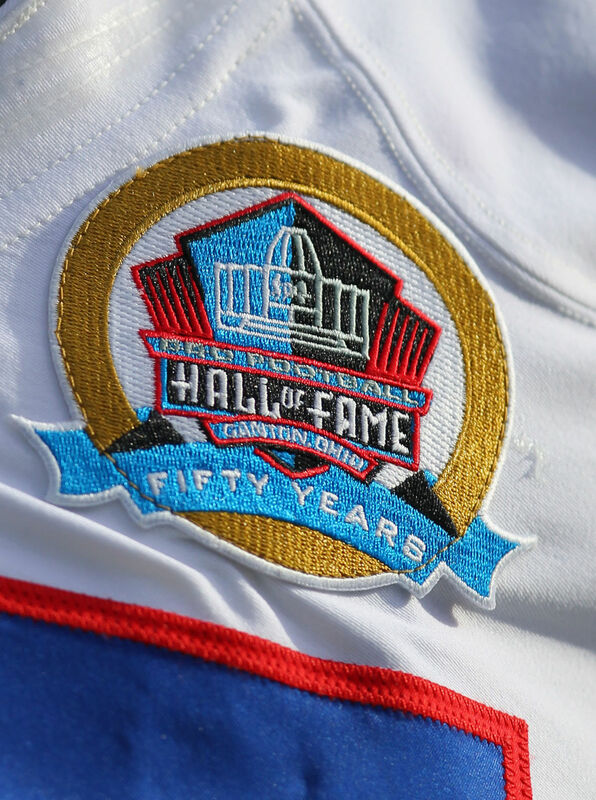 The dark blue jersey sported commemorative patches on two occasions, an “International Series” patch for the Week 8 game in London, and a league-wide Hall of Fame 50th Anniversary patch worn in Weeks 14 and 15. 2013, 2014: The five combos are worn. 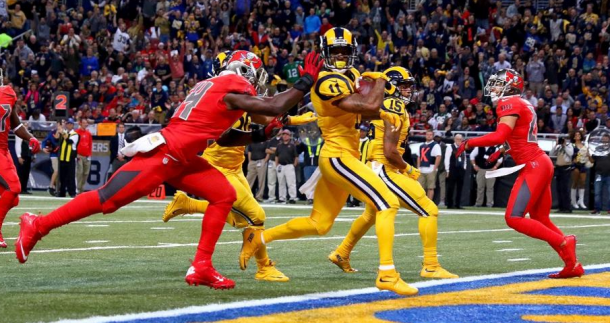 2015: In addition to the usual five combinations worn, the Rams – as part of the NFL’s Color Rush campaign for Thursday Night Football, wear an all-yellow uni for Week 15, with the jersey based on the blue throwback jersey, throwback yellow pants and full yellow socks and cleats. 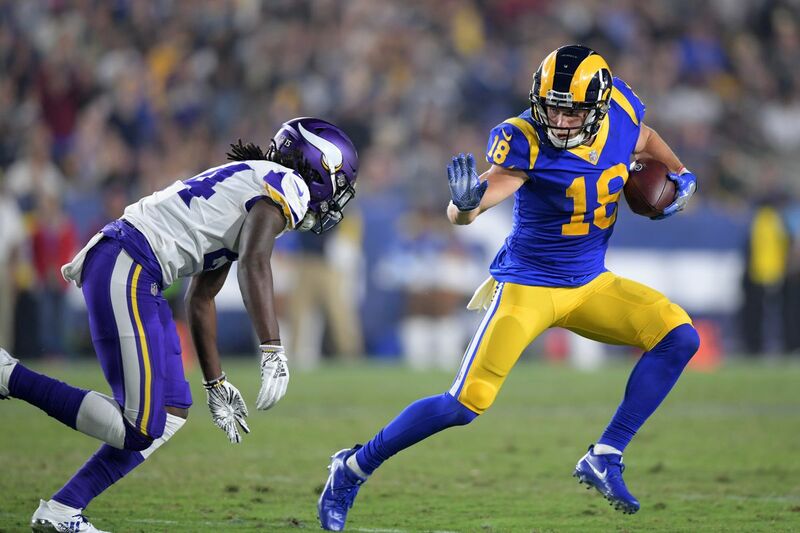 2016: As the Rams return to Los Angeles, the same five outfits, plus this season’s color rush (Week 15) which feature the white/white combo, plus the helmet horns were switched to white and the socks were 100% white. 2017: A real hodgepodge here. The Rams, apparently itchy to drop the gold and go dark blue & white full time, switch the helmet horns to white and go with white pants with a single blue stripe and blue pants with a solo white stripe. BUT, the jerseys are unchanged (except for the elimination of the fly wire collar) and continue to sport gold trim! The normal four combos are worn, plus the yellow color rush uni and the throwbacks. 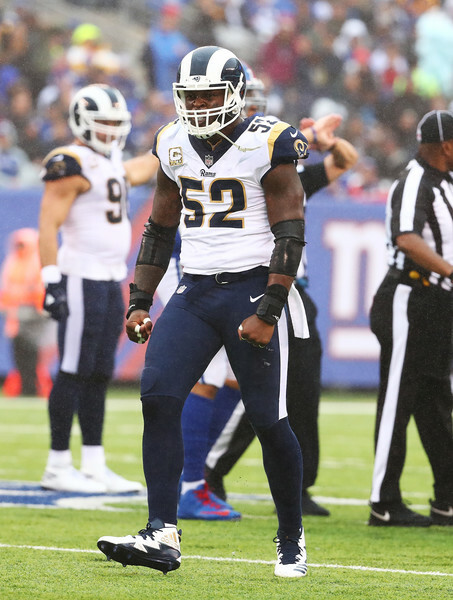 2018: With the Rams apparently not yet allowed to wear blue and white jerseys sans gold, the NFL allows the Rams to use the throwback set as their de facto home uniform. Meaning the dark blue jersey with white and gold trim is discarded. The yellow color rush is worn for two games and the white jerseys are worn with both white pants and dark blue pants. For Super Bowl LIII, as the home team, the Rams chose to wear their throwbacks, likely delighting the uni geeks among us. Once again, Tim, HUGE thanks for all your assistance with this. Readers, please be sure to give Timmy a big thanks for both yesterday and today’s ledes in the comments below! With Super Bowl LIII kicking off today between the New England Patriots (their eleventh appearance!) and the Los Angeles Rams, we should get a pretty decent-looking matchup — not even close to the best (nor even a Top 10), but certainly not the worst. At one time, I’d have ranked the games, but since it’s all opinion (based in fact), I won’t rank the games — but I thought it would be cool to take a look at every match up we’ve seen so far. And there you have it. The second set of 26 Super Bowls. Which game looked best? Which looked worst? Tell us below in the comments! When the Rams and Patriots meet up for Super Bowl 53, it will only be the 14th all-time meeting between the two teams (despite the Pats being in existence for almost 60 years and the Rams for much longer); one of those matchups occurred in Super Bowl XXXVI. As you all know, the Rams are designated the “home” team and have elected to wear their royal and gold “throwback” uniforms, while the Patriots will wear their regular white road uniforms (the matchup is approximated in the above graphic). It should be a decent-to-good looking game, but there have been better (and worse) matchups in the past. How have the teams fare in those and how did they look? The first ever meeting between these two teams resulted in a Pats win at home. Despite the awful carpet over poured cement playing surface, this was a gorgeous matchup — possibly the best looking of all their games. The Rams would win the next matchup, also in Foxboro. This time around, the Patriots wore white jerseys at home, along with their red pants. Another stellar uni hookup. The first game out west (this one in Anaheim) would see the Rams in blue/gold with the Pats in all white. Another game out west (Anaheim, again) would again see the Patriots victorious on the road, with the boys from New England wearing white jerseys and red pants. One could argue this was the best uni matchup of the series (and how great would it be if Supe 53 could look like this?). In 1989, the teams would meet again in New England, with the Rams continuing the trend of winning on the road in games between the two teams. Another glorious uni-matchup! The Rams would gain their first ever home victory vs. the Patriots in 1992, with one last wearing of the Pats in red pants. The next time the teams would meet, six years later, the game would be in the Rams new home city of St. Louis. The Rams were in the penultimate season wearing royal/gold, and the Pats would in their “transitional” uni set that bridged the gap between their original red/white and current navy/silver set. The teams would actually meet twice during the 2001 season — this game, won by the “Greatest Show on Turf” and the Super Bowl rematch (which would take place in 2002). This was a night game in Foxboro, and both teams were in their “current” uni sets. 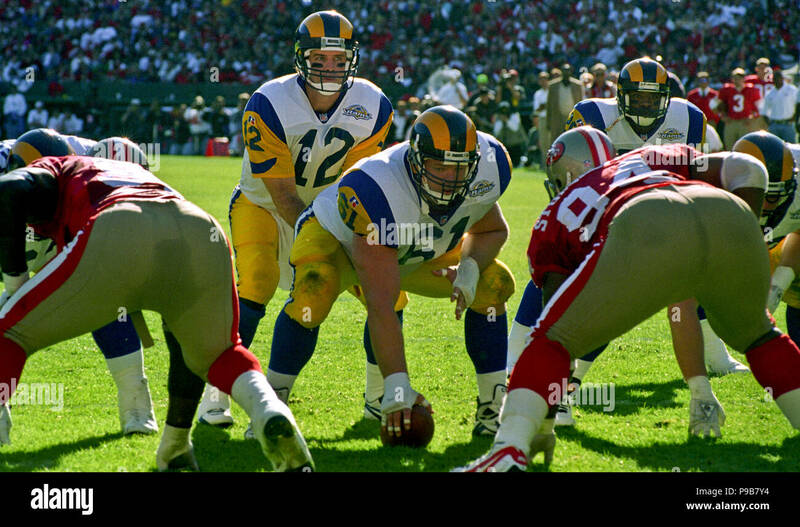 Note the awful side panels which were present in the first iteration of the Rams navy/metallic gold unis. The rematch from earlier in the season — the Supe — feature the teams in identical unis as they’d worn during the regular season. Only the result was different. With the league now at 32 teams, conferences would end up playing every team in the opposing division/conference every 4 years. The first of these would take place in 2004 in St. Looey, this time with the Rams wearing blue tops and metallic gold pants. This was probably the best looking matchup of the “current” uniform sets. Back in Foxboro, the Pats wore their standard home unis, but this time the Rams went with blue pants. The 2012 matchup between the two teams would occur neither in St. Louis nor Foxboro, but in London, England, at Wembley Stadium, with the Rams designated the home team. 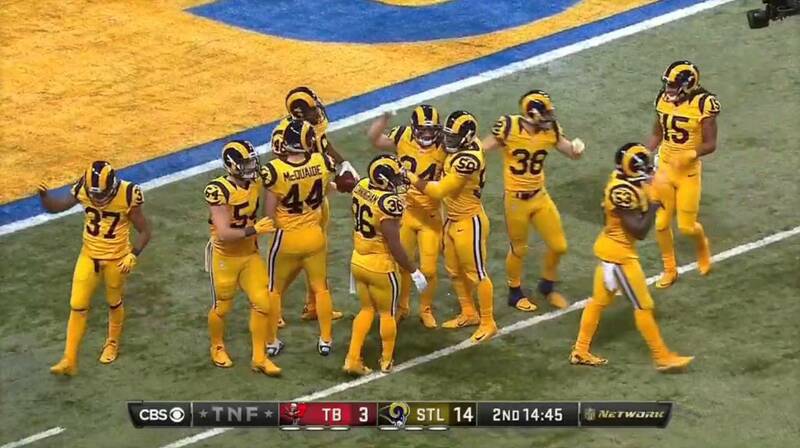 It gave the Americans a chance to show the Brits (and the world) a truly awful uni matchup, with both teams sporting navy pants (and the Rams going mono-blue). The final meeting between these teams before Supe 53 took place in Foxboro, and the Pats again emerged victorious. It would be the third (and hopefully final) time the Rams would wear blue pants against the Pats. So, there’s your uni “history” for the Rams and Patriots. 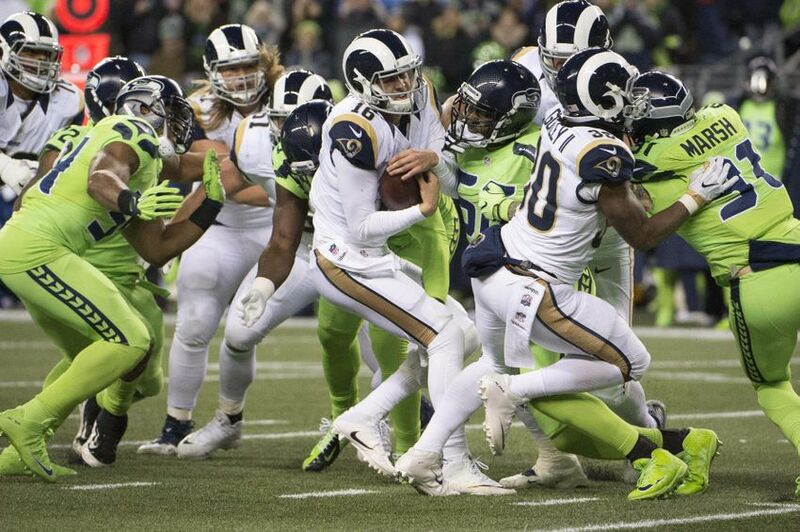 Thankfully the Rams have chosen to wear their throwbacks for Super Bowl LIII — it may not be the best looking game ever between the two teams, but it should still look pretty nice. • Here’s my annual Uni Watch Super Bowl Preview, with lots of uni-related tidbits about the big game. • Yesterday on the blog, we took a look at the very odd shoes that Rams running back Wendell Tyler wore in Super Bowl XIV. • Remember, Super Bowl Sunday is also Puppy Bowl Sunday! Here are 243 photos and 29 videos that I shot during the taping of this year’s event. That’s it. Enjoy your weekend! Sometimes, folks just outdo themselves. That’s certainly the case with today’s TGFTT. Check out the backyard “field” created by Andrew Shehorn, who created his own Super Bowl LIII field, replete with endzone and midfield logos. Baseball News: The Supe may be on everyone’s mind today, but baseball (and pitchers & catchers!) isn’t far away. 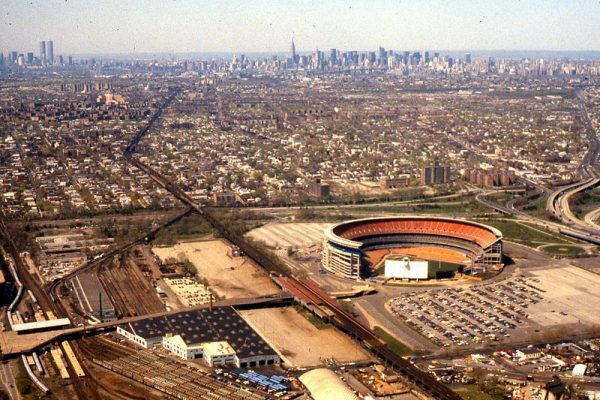 In the meantime, feast your eyes on this beautiful vintage photo of Shea Stadium. No date, but it’s gotta be close to its construction having been completed (from Jeff Flynn). … Check out this classic commercial, you can tell the footage of Ralph Kiner is from 1951 by the NL 75th Anniversary Patch on his left sleeve (from Bruce Menard). … If you look closely, you’ll see different helmet and cap W’s in this picture from the 1973 WKU baseball team (from C-USA Refs). Helmet W’s look like the “Wilson” logo, and one of the caps looks like a Washington Senators curly w! … In case you missed it, the Oakland A’s released a spring training cap featuring a white elephant, which harkens back to one worn on their unis in the 1920s (from Brinke). … Here’s a sneak peak of some of the Astros items that will be displayed in the Astros HOF (from Ignacio Salazar). … Roger Clemens wore a Red Sox jersey and played in the UT Alumni game with sons Kacy and Kody (from Mike Barnes via Paul). … Oregon baseball and softball have some new white unis (from Go Ducks). College/High School Football News:There’s a new look in 2019 for Hamlin High School (SD) football, which will feature a custom lighting bolt stripe along with pride stickers on one side and player number on other. Previous seasons show old “H” logo w/ player number on back or side and old stripe (from Chris Lather). Hockey News: The Calgary Hitmen are playing 3 games in February at the 69 year old Stampede Corral arena, notes Wade Heidt. “During those 3 games, they will wear the uniforms of former Calgary teams that called the arena their home. A combination throwback involving old uniforms and an old arena. They dressed as the Calgary Centennials on Friday night. The Centennials were Calgary’s major junior hockey team in The Dub (then called the WCHL) from 1966-1977. They even went into small detail such as changing the helmet sticker to the Cents logo.” … Here’s an interesting story on a Brett Hull jersey (from Eric Spoonmore). 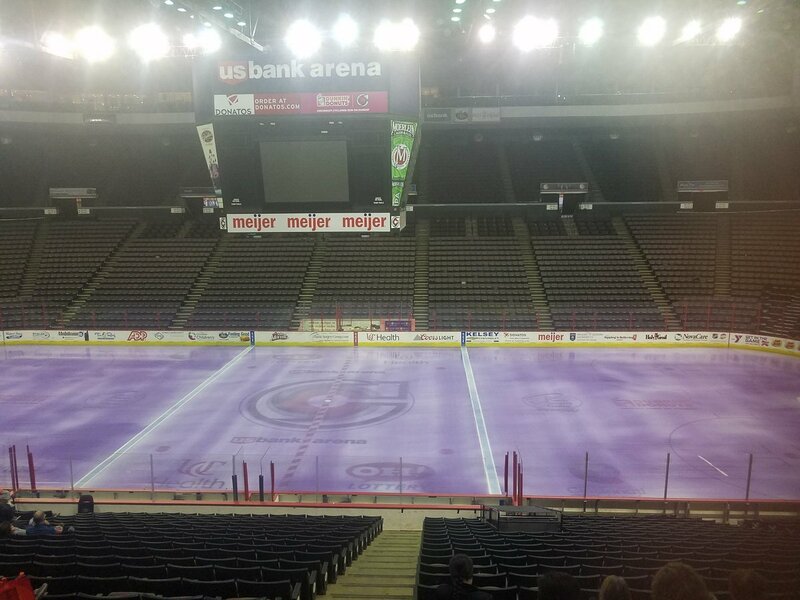 … There was purple ice for last night’s Cincy Cyclones “Fight Cancer” night yesterday (from Bill Fenbers). … Check this out: German hockey team comes out in unis designed by children (from J.W. Cannon). … Last evening the San Diego Gulls wore “pink in the rink” jerseys (from Gregory Smith). NBA News: Our own Lloyd Alaban writes, “My Fox affiliate (KTVU) is still using the old NBA logo with the old font and old colors.” … In the days before Super Bowl LIII, Golden State Warriors forward Kevin Durant and Los Angeles Lakers forward LeBron James both donned black Colin Kaepernick jerseys ahead of their games as takes have heated up about the blackballed quarterback. 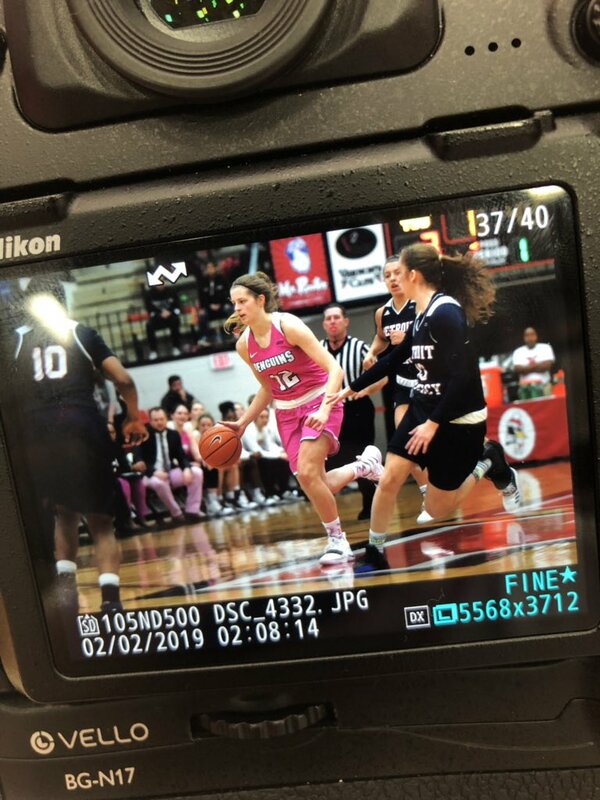 College Hoops News: The Youngstown State University ladies wore pink uniforms yesterday in their matchup against Detroit Mercy, who wore blue, creating a color vs. color game (from Robert Hayes). … FSU’s Terance Mann ripped his jersey in frustration after missing a layup in the 2nd half against Georgia Tech. According to submitter James Gilbert (and confirmed by the video announcers), that’s his third ripped jersey this season. 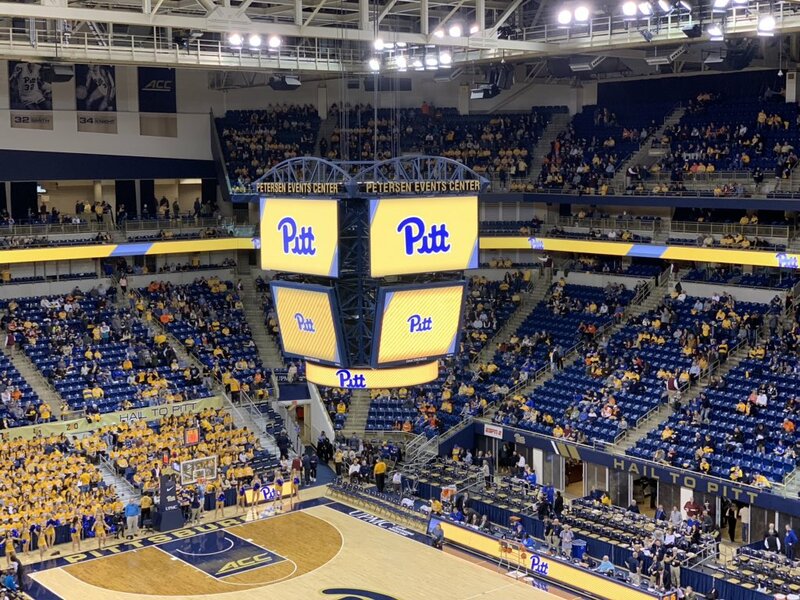 … Last night, Pitt & Syracuse played at the Petersen Event Center. 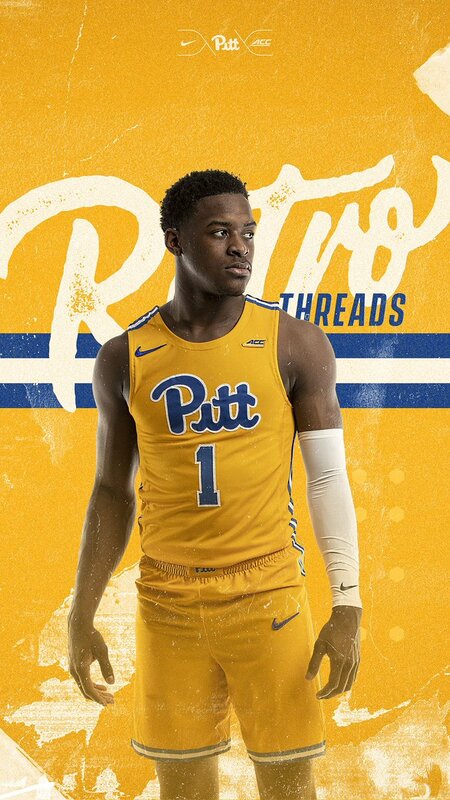 Pitt played in throwback tops. 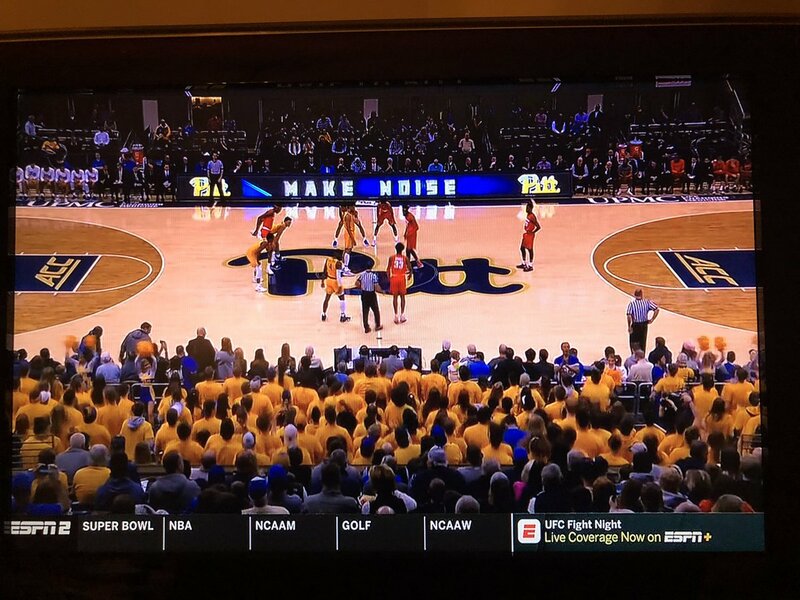 Graphics matched (second link from Noah Kastroll). It was a nice color vs. color affair (from Robert Hayes). They really were some good looking unis. … “With waistband roll being a recent trend, LSU player versus Arkansas doubles down with a waist and double leg roll to create some really short hip huggers,” notes Tim Walsh. “Second photo is for perspective on what the normal shorts look like.” I’m guessing Jimmer Vilk approves but still doesn’t think the rolled shorts are “short” enough. Grab Bag: The Southern Illinois University Carbondale Salukis will be getting a new logo on February 28th (from Nick Yelverton). … There’s a new addition to this year’s Loyola Lacrosse helmets as their players rep their home states, provinces and nations (from Loyola Men’s Lacrosse). … Not sports related, but still pretty cool: check out these vintage pics of postal workers from back in the day. 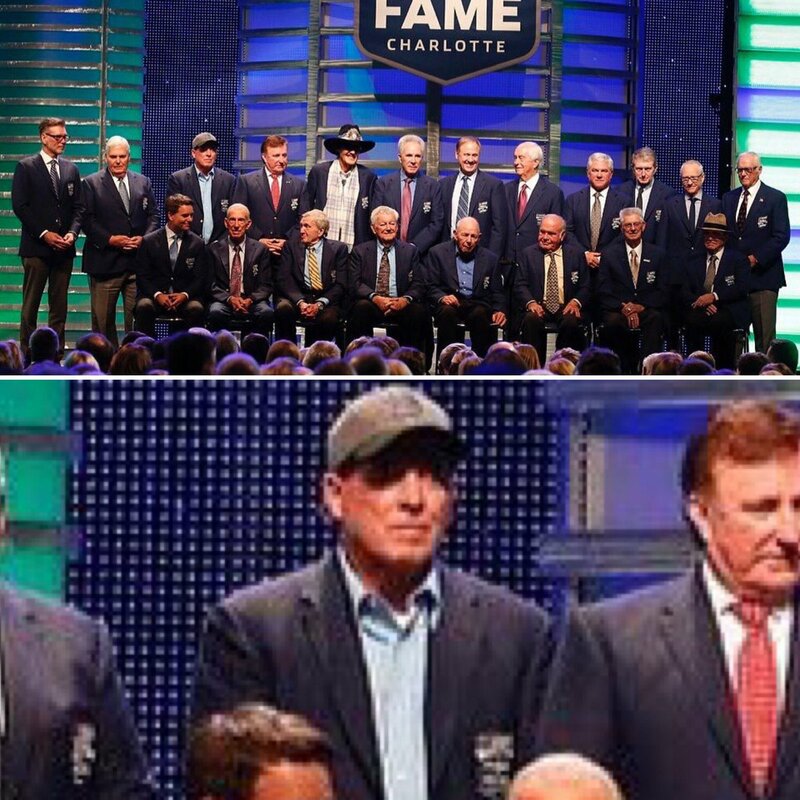 … Did you know NASCAR has Hall of Fame jackets? Now you do (from James Gilbert). The Shea Stadium picture is from the early 1980s, when they changed the seating from wooden backs to plastic and the colors for each level were also changed. Soon to come: more blue paint, extensive work on the press level luxury boxes. The orange and blue corrugated squares have already been removed from the exterior. Not to mention the WTC towers in the background, placing it well after its opening (1964). Yeah, I wasn’t even looking at the skyline — so my bad there — but I don’t see (although it’s mostly cut off) any of the National Tennis Center stuff, which was opened in 1978, which would be to the left in that photo. That’s what threw me. But definitely NOT 1960s for sure. It was the Colts-Bears game that caught my eye. The Corral is slated for demolition pending the approval of the expansion of a convention centre. Demolition could start later this year. When built in 1950, the Corral was the largest arena by capacity in Canada west of Toronto for a brief period. The team moved around frequently after leaving Calgary in 1977. Became the Billings Bighorns, then the Nanaimo Islanders (for just one season), then the New Westminster Bruins (version 2) before becoming the current Tri-City Americans in 1988. Per the GUD the Rams wore these white pants for one pre-season game in 2001; the navy version never was seen again after the unveiling. Typo at beginning: 1992 and 1993 should be 1972 and 1973. Great write up on the Rams uniform history. 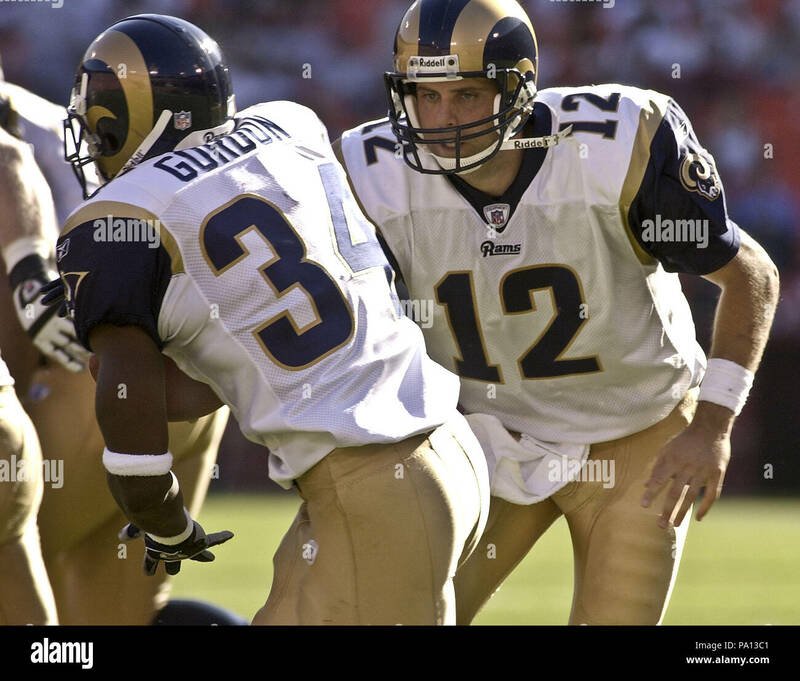 One curious oversight: in 2000, when the Rams went to the champagne gold set, they changed the number font (compared the old diagonal bar on the 2 versus the new horizontal bar) and added an outline around the numbers. The next year, they changed the font again, to the unique, more rounded number set they still use on their non-throwback set. You can see this in the photos linked for 2000 and 2001 in the story. In 2000 the uniforms were from Puma; they had standard block numbers. When Reebok took over in 2001 they went to the rounded font still used on the navy and white jerseys. Speaking of Premier League kits this weekend. I really like Watford’s primary kit, but I dig the double green change look. Bournemouth has a great badge. You get to decide. It can be lines depicting movement of the player heading the ball. Or maybe the player just has long hair. 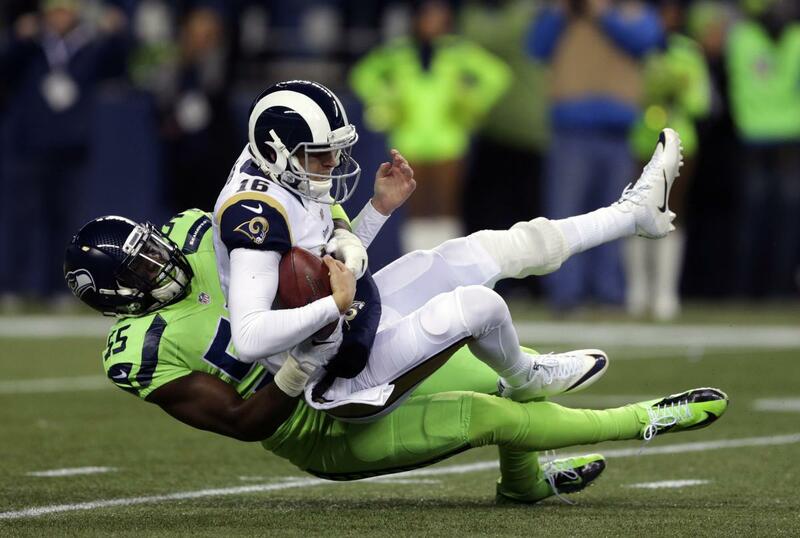 The most visually jarring change in the Rams unforms isn’t even mentioned. When they changed to the St. Louis look, the jerseys had a proper block number font. The next year they went with the silly font still in use. I always wondered why they downgraded. 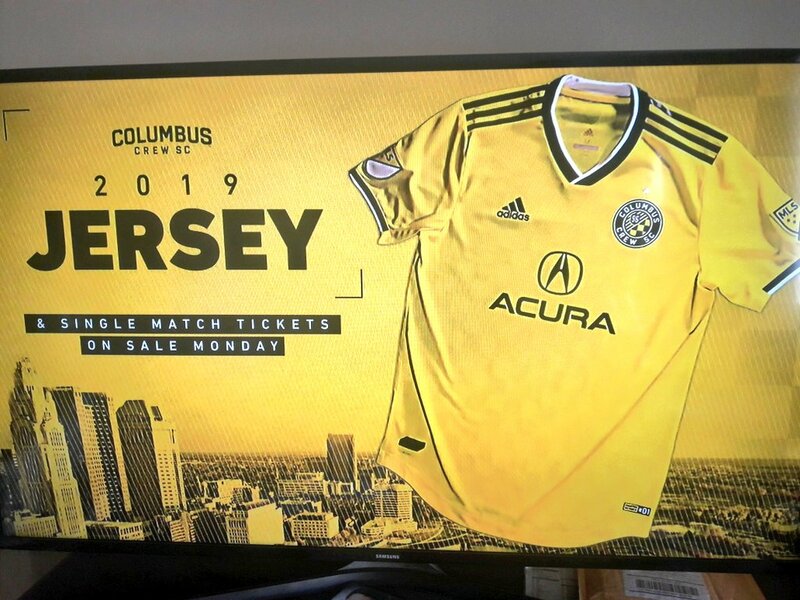 I can’t find anything on the net about this, but I seem to recall that for some reason, the numbers in the new font weren’t quite ready for the 2000 season, which is why they went with the block font (which of course looked way better). The replica jerseys sold to the public at retail that season sported the “new” font. The German hockey team in question is Adler Mannheim. Big fan of the Pats-Giants matchups. I also enjoyed how weird the Broncos-Seahawks matchup looks. Yeah the 1982 sticker album had a lot of that going on… As a kid I looked at a lot of those background shots wondering what was going on… Not exactly negatives… It was like some strange editing was being done to them. One of my first moments obsessing over uniforms. It’s most noticeable when comparing the ‘2’s. Isn’t it possible the 1974 home uni worn by the Pats in the pic above is the best looking all time football uniform? Just about every game played at the Rose Bowl looks scrumptious uni-wise, except for the Raiders/Vikings. That being said, I like Vikings/Dolphins, something about the almost but not quite foggy nature of the light made the aqua/teal of the Dolphins REALLY pop. Redskins/Dolphins at the Rose Bowl. Again the teal pops, but the Redskins always looked awesome with the white jerseys/burgandy pants. Buccaneers/Raiders. There’s just something about the sunlight in So Cal. Cowboys/Colts. i really like those particular blue Cowboys unis. For me at least, how the field looks plays a part in whether or not I like the unis. Also I have to say that Mercedes Benz stadium has the best indoor lighting I’ve ever seen, it doesn’t look like you are indoors. Would love to see a ranking of the all time worst uniforms worn in the Super Bowl. My vote goes to any of the “modern” styles, along with the few mono color looks. Every game played in the SuperDome looks kinda ugh, at least from a uni standpoint by my reckoning. I think it has a LOT to do with the lighting. I recall Steve and Ed Sabol bitching about the lighting on a NFL Films clip some years ago, I believe the word ‘dank’ was used. Not a big fan of the 49ers/Bengals matchups. The first Patriots Eagles game was also kind of ugh, again seemingly due to the lighting at the stadium. 49ers/Dolphins, I think the Dolphins look awful in all white, if they’d worn the teal pants that would have been great. Broncos/Falcons is not quite ugh, more just blah. If the broncos had worn blue pants it would be better. As far as the mono look goes, counting white and dark unis there have been 17 teams going the mono look, the only team going dark being the Seahawks, the white being the Chiefs/Jets/Colts (twice)/Vikings (twice)/Dolphins (twice)/Bengals/Broncos (three times!! )/Bills and Ravens. The eagles shade was also a little darker on the home jerseys back then compared to last year, but I agree the lighting also sucked. Falcons two years ago very worst. Phoenix was very bad too in their lone appearance. Best look was Bears in ’86. Raiders, Cowboys, and Packers always looked good. Eagles ’81 were also fantastic! 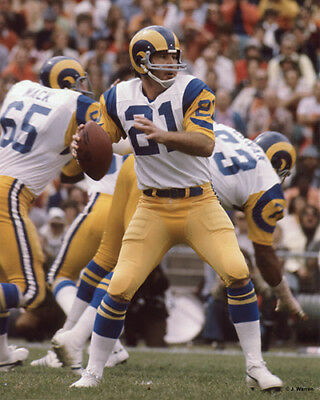 Best thing about the 1973 Rams uniforms was John Hadl wearing number 21 at quarterback.